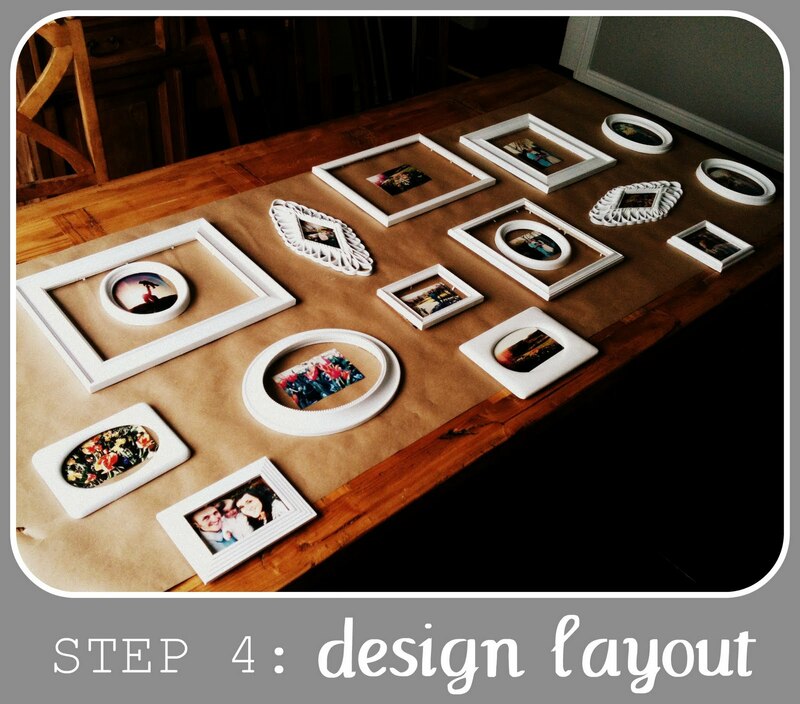 I've been working on this framed photo display for a while now. 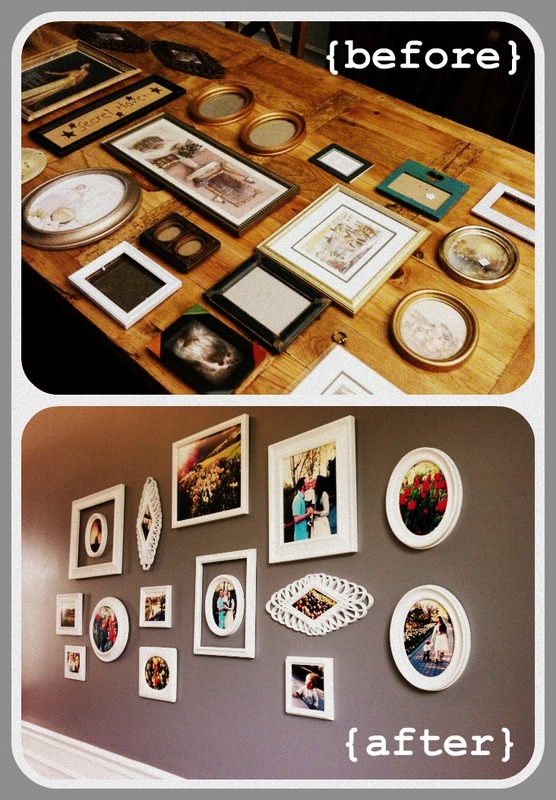 I was inspired by my stellar sister-in-law Becca :) She has a wall filled with unique white frames and beautiful pictures of her little family. I couldn't help but follow her lead! 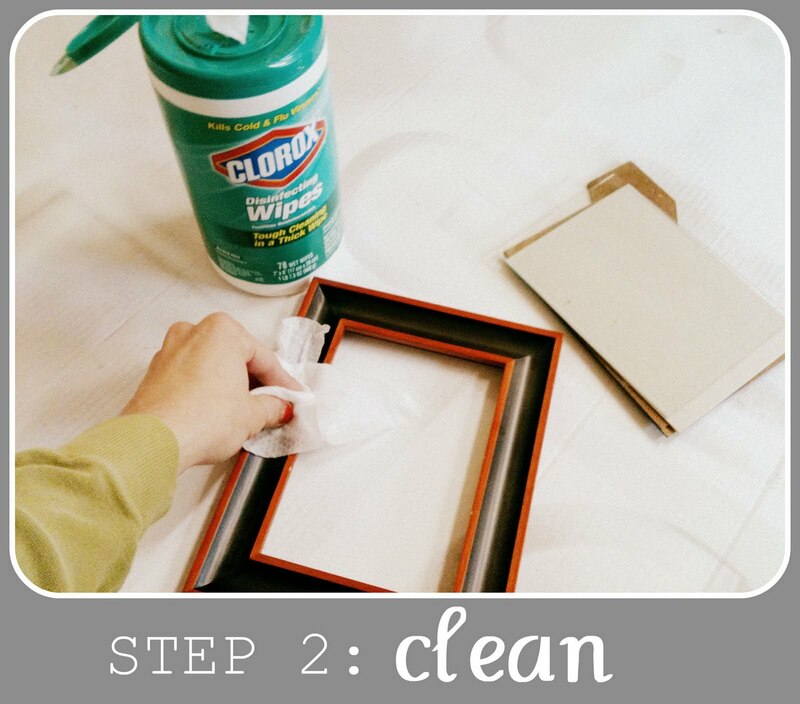 - INSPECT THE FRAME...even little nicks and scratches on wood will show up and be more apparent after you paint the frames. - WIPE OFF...and sand to smooth any areas you notice need it. - SPRAY 1 COAT OF PRIMER, not much goes a long way. 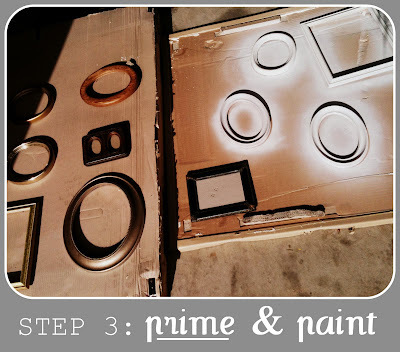 - BE SURE to let each coat dry before you apply the next. - I first ORDERED THEM AS 4x6's [from Costco, best prices I've found]...then decided which one's I wanted to enlarge. 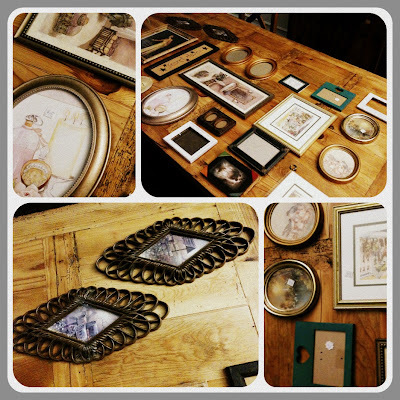 - I displayed the frames and photos the way I wanted, then marked where the nails should go. 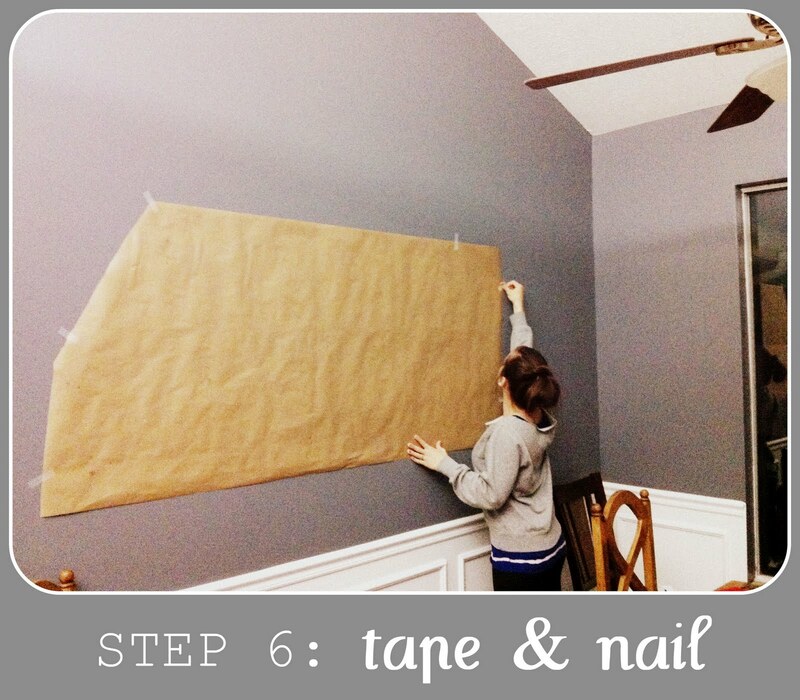 - TAPE UP "template" to the wall...then HAMMER (or in our case wrenched;) THE NAILS in the wall. 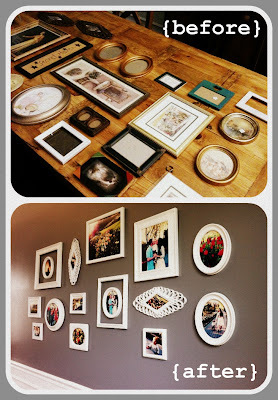 - I used picture hanging nails (from Lowe's) and Command Picture Hanging Strips (from Walmart) to get all the frames up. 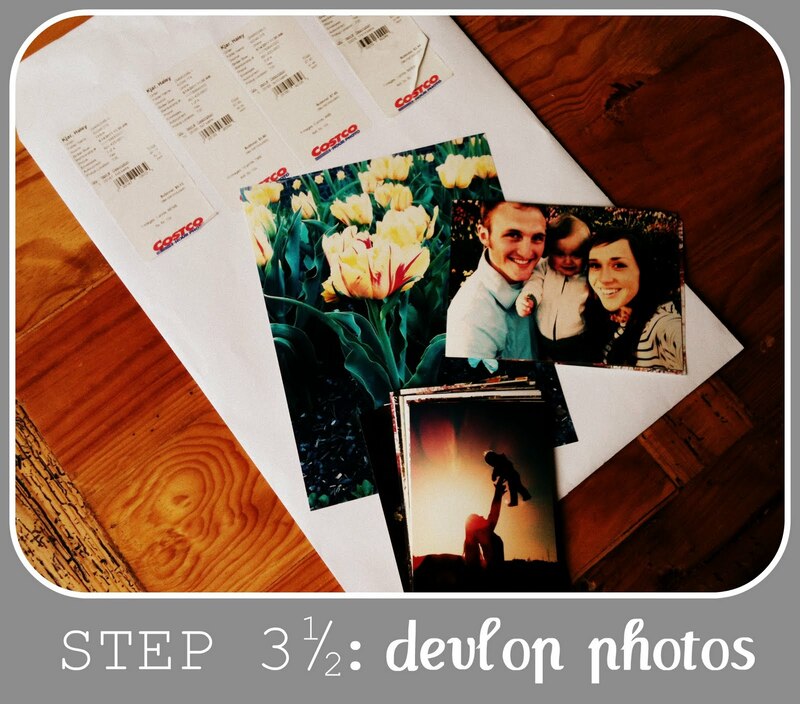 I've found [on my beloved Pinterest] a few more unique ways to display photos that'd I'm excited about...can't wait to get going on them! Can I just say how much I love your blog? I am such a big fan! 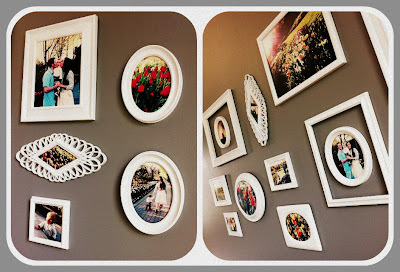 Your wall is simply stunning and so classy! I have been meaning to do some wall art and have been having a hard time trying to figure out exactly which frames to use, etc. I am a friend of the Kjar's (went to preschool with Adam)! :) Anyway, great job on this tutorial and thanks again!! Haley! This is so awesome :) I definitely want to do this someday! and thank you so much for the comment you left me earlier today! Well Well WELL, little Ms. Haley! You are simply amazing!!! 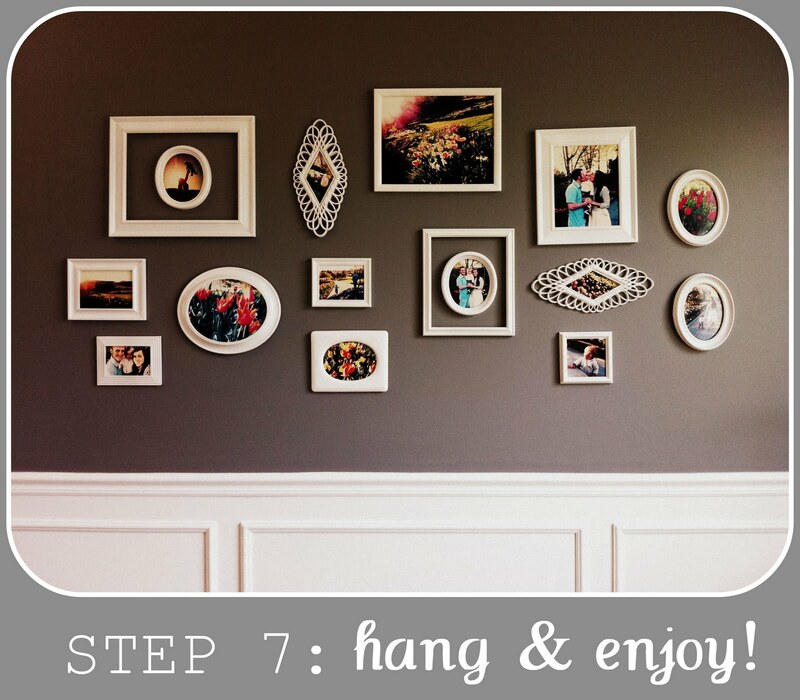 I have tried and tried to create an awesome photo wall, but to no avail! It never turns out how I see it in my mind! But now that I have your wonderful tutorial, I see good things in my photo adventure future!!! WHEEEE! I can't wait to try to replicate this! I have a whole crate of collected frames in all shapes and sizes...so at least that part is done! p.s. I love the wall color!! wow wow wow wow. this is so cool!! thanks for sharing. it looks great, you're so creative. What a fantastic project! 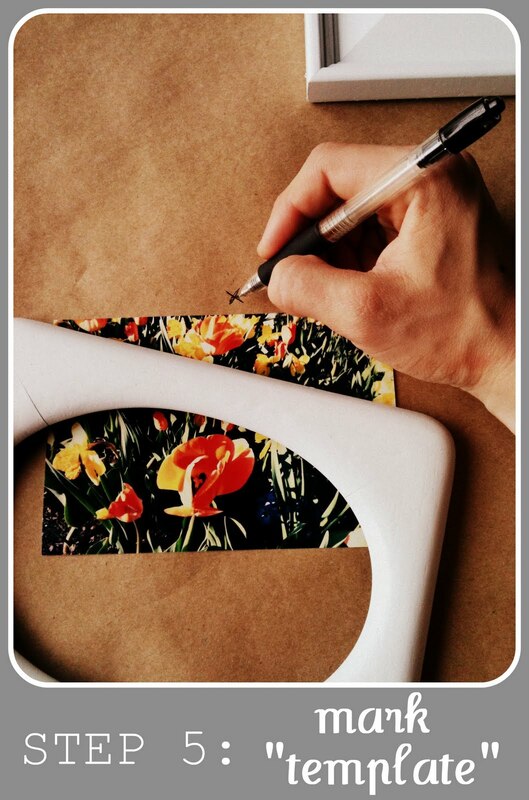 And I never would have thought of making a 'template' like that! Brilliant! Wow! I am once again impressed with your creativity! I would say that I will copy this idea for my own home, but I know that I for sure would mess it up somehow! I made my mother in law something crafty for Christmas this past year with modge podge... it went terribly wrong. But I do enjoy seeing all the cute things you do. Your wall looks GREAT! Yep another reason I love you! When I move into my new casa next week I will be doing just this. We are renting though so that is awesome you showed those sticky holder things. Love the way it turned out. LOVE IT, Hay! It looks fantastic! Can't wait to see it in person. Girl this is simply fabulous! I love that you used the construction paper to layout on the wall where the pictures should go. I will do this FOREVER now, it will especially help my husband who seems to get very frustrated with hanging things hahah. I really love this!!! I've been wanting to do a picture wall in our living room for a long time. Need to start keeping my eyes open to cheap frames to paint. Oh my gosh I absolutely LOVE this!! I wish I had a house to decorate! Maybe my apartment bedroom will have to do for now.. This is so amazing. I've been collecting for months! 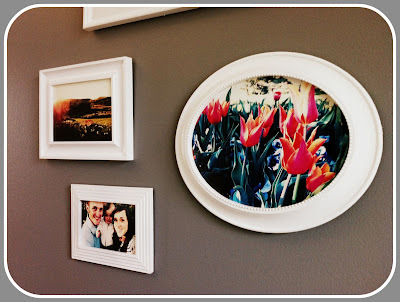 I needed some more inspiration to keep looking for those cheap frames! Yours turned out great! Haley this is beautiful. So impressed..so so impressed! 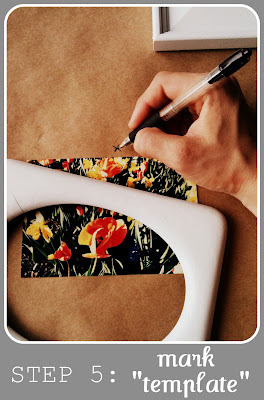 Thank you for this awesome tutorial..this is a different way than I've seen in the past and really like it. I'm thinking all my bare walls in the new house are calling for this very thing :) Im also loving the wall colors and the moldings, so elegant! Great job! I love it! It's beautiful! I'm your newest follower! You did an AMAZING job! 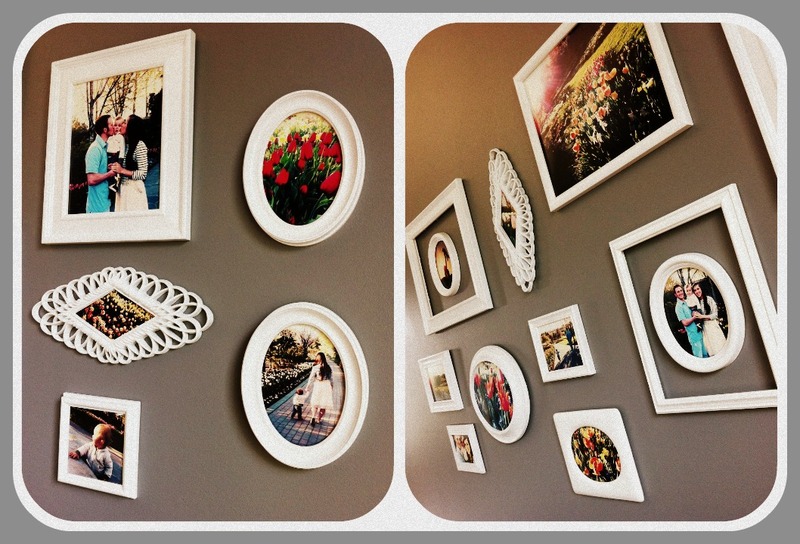 I have been wanting to add a photo wall in my home for awhile now...a mixture of my family and my girlfriends. Your wall is going to be my inspiration wall! It looks absolutely perfect! Your patience most definitely paid off. girlfriend...I did the same thing in our little idaho apartment! Except they were silver because we couldn't paint the walls. Sadly it's all packed up now but I'm glad to see you doing it too! It looks so gorgeous with the paint color and the white frames. DI and goodwill are the best :) I don't think I'll ever buy frames for full price again. Plus, it's so fun to do! Bravo my love. OMGosh!!!!!!! This is the best tutorial I've ever scene! My dear you have a gift! Thank you, thank you! Nicely done! I love gallery walls and your gray wall. I love it! You're so creative! I've been trying to think of a non-tacky way of displaying a bunch of great photos and I'm definitely going to try this. YES - this looks SO good! You really applied patience to this project, I can tell! 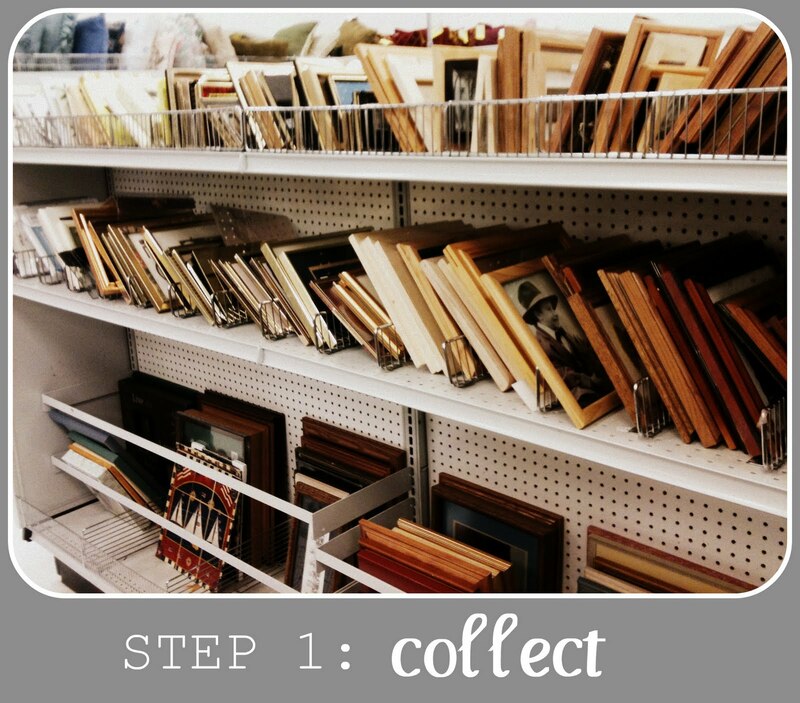 I did the same thing with thrift store frames but on a smaller scale. Yours seriously look so great! You've officially inspired me to make another gallery wall. Good job! This is so amazing! 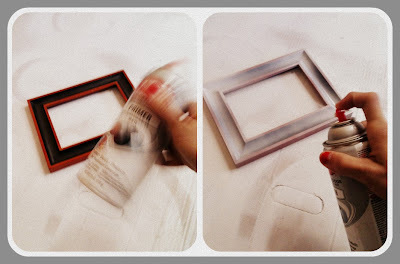 What a great idea buying old frames and painting them all the same color to match. I would have just looked for my specific color and wouldn't have thought to paint them. Great job and great idea! I love it! 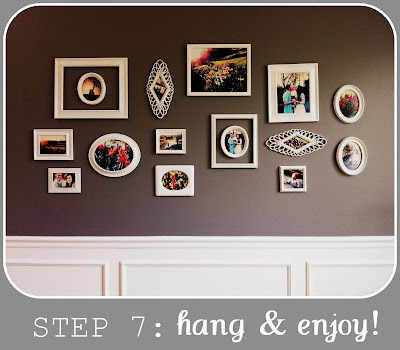 I pinned it for inspiration for when I do my living room gallery wall. Thank you for sharing. I am visiting from whipperberry's linky party. Come and say hi I love visitors and I am doing a really fun giveaway next week so come back and check it out. Love this project you did, it turned out amazing!!! for the frames! You hit it out of the park. I absolutely love this. My sister and I had started talking about doing a photo wall for my mother for her birthday and when I saw what you have done I knew that I had found our inspiration. Now we are off to comb through our local thrift stores for interesting looking frames. Thank you so much for sharing. Lovely Haley! You've got talent. I love the colors of your walls and the wainscoting on the bottom as well. Great gallery! Tell me, how did you feature this post on Tater-tots and jello? 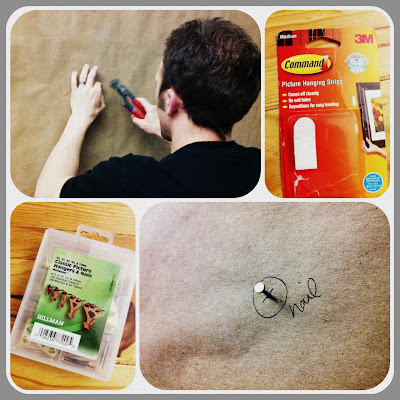 Oh, and thanks for the wrapping paper tip. That's a great idea to put so many holes in wall.